This is one of the coolest bits of Star Wars trivia to come across out desk in a while. Bossk was a non speaking bounty hunter that was briefly spied in Empire Strikes Back and even more briefly in Revenge of the Jedi (On Jabba’s sail barge which I guess means he’s dead now…). Legend has it the Bossk costume was actually a space suit recycled from the 1996 BBC production Doctor Who episode called The 10th Planet. How does this come about you might ask? Star Wars was largely made in England so you can image the costume designers rummaged through a whole lot past costumes and props for their production and given it’ ‘space suit’ qualities, it was used. OR there might be other reasons as to why the suit ended up in Empire! The suit has actually been identified as a ‘High-Altitude Windak Pressure Suit’ which was used by English RAF pilots in the 1960s. 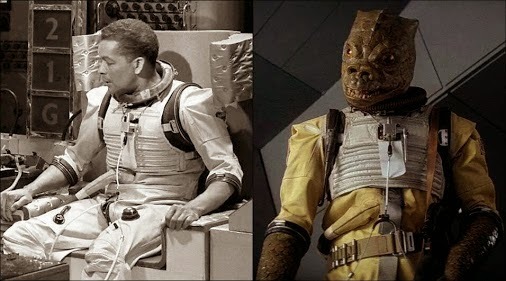 So the suit on Bossk was not necessarily from the good Doctor’s production but is arguably of the same vintage. Eagle eyed trainspotters might have spied the suit in the Cantina scene in A New Hope as well and possibly on some A – Wing pilots found skulking in the back ground of briefing missions. Heck, Luke Skywalker even wore one… so the question is how many High-Altitude Windak Pressure Suits are there in Star Wars then? And if you are wondering about some other of the bounty hunters spied in the film, check out IG-88's origin story. Probably only two. The earlier model , yellow one worn by Bossk and the cantina spaceman and the blue, later model worn by Bo Shek. The other suits are probably all props, as they lack the details seen on these two original suits. It actually is a space suit. It's a prototype British space suit, rather than a high altitude suit (well, space is really high altitude) made by BWT Aerospace in the early sixties. It wasn't used by the RAF and was never put into production - although some components were used by the US space program.